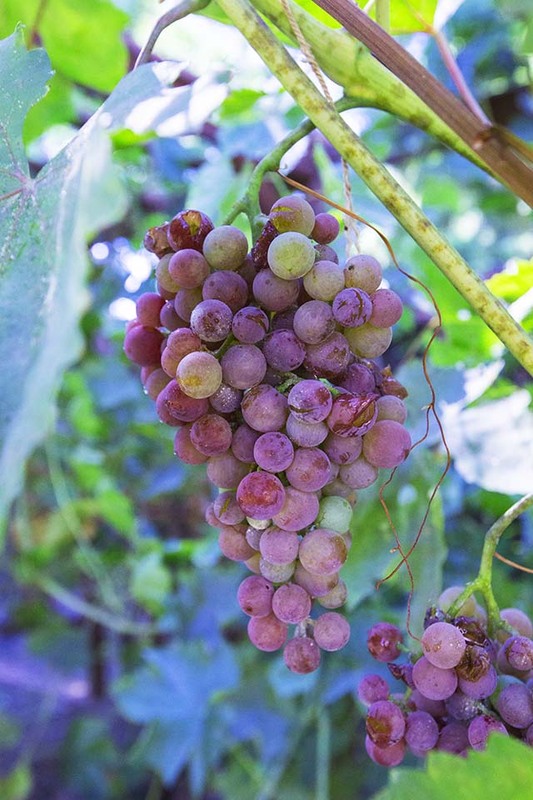 The white hazy stuff on grapes is a yeast that helps to protect the fruit from bad bacteria. It is called ”bloom.” It is not harmful to humans or the grapes. Do not wash it off. When chickens lay eggs, as the egg moves out of the canal, it is coated with a “bloom” that protects the eggs’ porous shell. In fact when you watch the egg come out of the chicken, the bloom is wet and dries immediately on the eggshell. I am in the final week or two of my grapes getting ready to harvest. My wife and I had our grape vines enclosed with an open fencing to allow the grapes to grow and not be eaten by the birds and squirrels. They cannot get through the small openings in the fence wiring. These animals and birds know just when your grapes are perfectly ripe. That’s when they come to eat the fruits of your labor (puns always intended). The red and purple grapes have such a beautiful collection of colors. I wanted to take some photographs of them at their peak. I love the varieties of textures and colors in one bunch of fruit, some ripe and bursting at their seams, others drying and withering into raisins. Shooting in the early morning light gave me a rich choice of blues in the open shade. The color temperature of daylight is blue early in the morning before it turns golden when the sun rises. Note the yeasty bloom appearing as a purple or white haze on the grapes. Grapes were eaten during my photo shoot. In fact if you look carefully, you’ll see faces in the grapes and lots of blooming coatings. 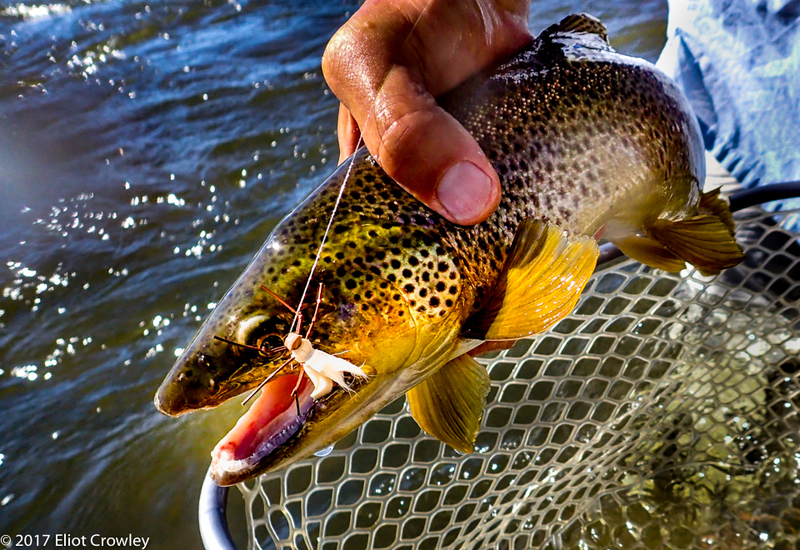 I learned to fly-fish when I met my wife. She had been fishing for years and throws a beautiful line into the water. So I have seen lots of photographs of trophy fish. 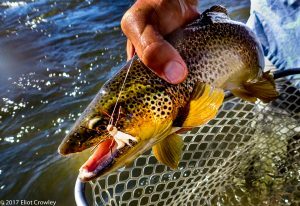 Having that knowledge, while on our latest fishing trip, I wanted to try something different. Armed with my Olympus Tough camera (Water proof so not afraid of dropping it in the water or it even getting wet) was ready whenever my wife caught a fish. She catches more than I do. Years of experience and all. I think I got something different and interesting. Being willing to take a chance and fail is what makes for wonderful experiences and photographs. It was a travel day today. My remaining time here feeling seriously constrained by what I still need to finish. An art space in the old city of Mandalay, here in Myanmar, might ease part of my angst this morning. Bronze casting is an impressive art. Part clay sculpture, part metal work, all of it a fully developed art form that takes weeks sometimes months to complete. The scale of work alone is crazy. 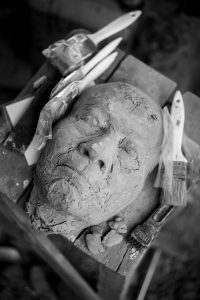 In this cluttered and noisy workspace I saw a single clay form elevated quietly on a sculptor’s stool. It’s evolution to a bronze figure interrupted by a millon other projects competing for attention around it. Just a couple pictures. Using the depth of field to create enough fall off around the surface. An old beat up picture with the face of a man lay just outside the frame. From a photograph to a clay sculpture and back to a photograph again. Credit due to the sculptor. Good fortune credited to me. 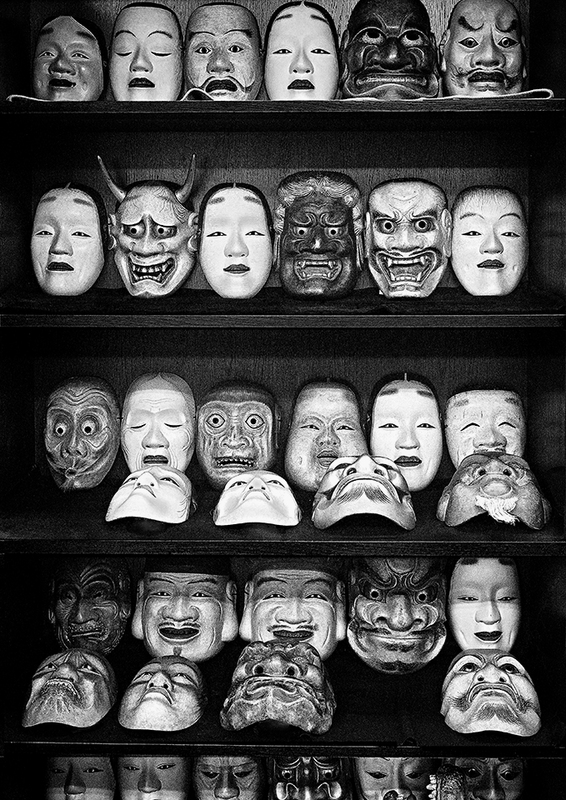 I met a Japanese contractor who had retired from his career, and now hand carves ceremonial masks almost every day. This he does just for his own muse. I and others had just met him so I used my camera quickly to document the moment with only available light. 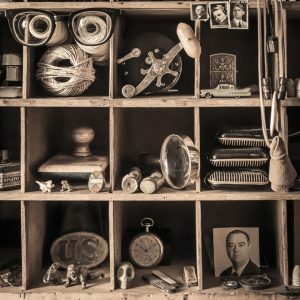 The basic cabinet in his studio holds some of his works. When taking this shot I thought his work was amazing but deserved a nicer presentation than what I saw on the rear camera LCD. Today I made it better by simplifying the tonal range and darkening the none essential open cabinet. The grain was enhanced by the conversion to BW on top of the 6400 iso effect. I currently like the feel of the old ‘tri-x look’ and when this is printed on matt paper it starts to look more like a hand made printmaking process. 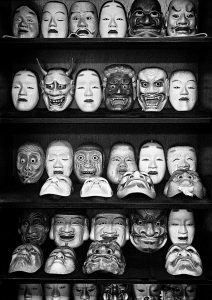 The presentation of a multitude of faces is a way of showing his commitment. I inherited an antique desk, which was made at the outset of the Civil War. It was made for our family member at that time who was to oversee the family farm while the head of the household went off to war. Now it is my desk. 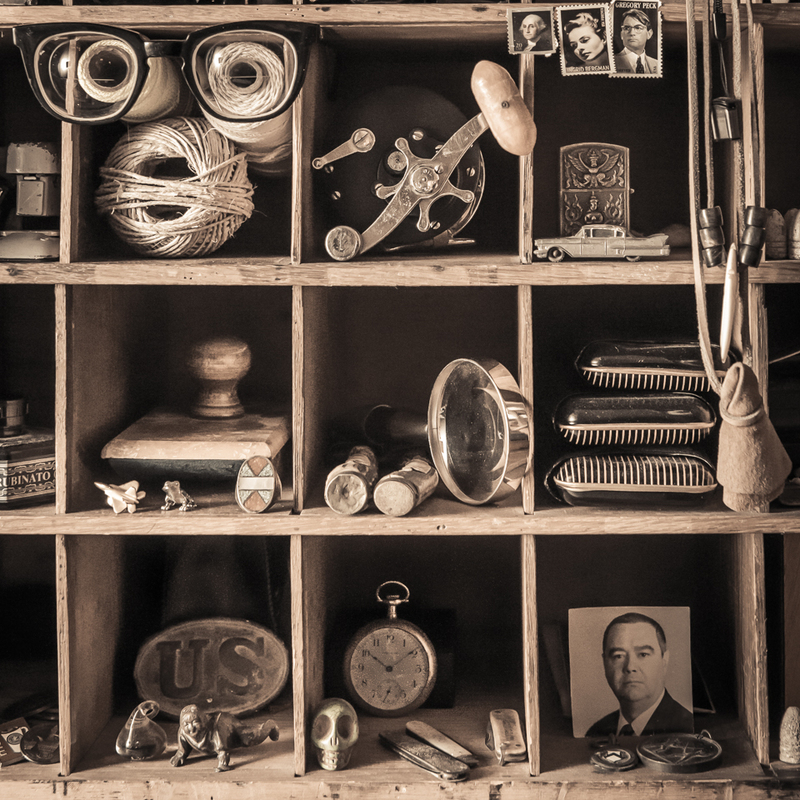 At its center is a series of cubby holes, and I have various personal effects and silly props parked within them. Over time stuff has collected that tell stories of me. The cubby holes contain pieces of a life. There are many faces in the crowd. It is not the simplest sort of picture, so it may not play well for the game. It’s a picture that invites study. How many faces do you see there? This image is a cropped piece of a larger image. I was captivated by the harsh light, contrast and shape in this vintage locomotive image. The repeating circles give the composition a strong visual form. 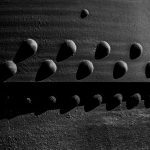 The harsh sunlight punches the highlights to the extreme and creates the coal-like black tones that give the image a striking appearance. The aforementioned crop also reveals a face of the locomotive, slyly smiling for the camera. I am always on the prowl for faces in inanimate objects, somehow it turns this multi ton piece of iron into something more anthropomorphic. It appears that in our need to organize and control things around us we have come up with ways of measuring almost everything. A “gauge” is basically an instrument or device for measuring the magnitude, amount, or contents of something. Wither it is the velocity of an object flying though the air or the temperature of air, liquid, even the temperature of our own bodies. From oil pressure, amps or voltage we have devised a way to meter it all. And it seems like”Time” and it’s measurement and management there of takes a lot of our “time.” Pun intended. 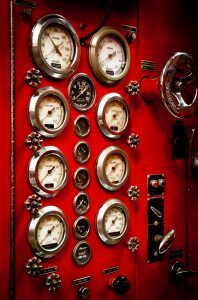 The image displayed here is a side control panel of a 50’s Crown fire engine. 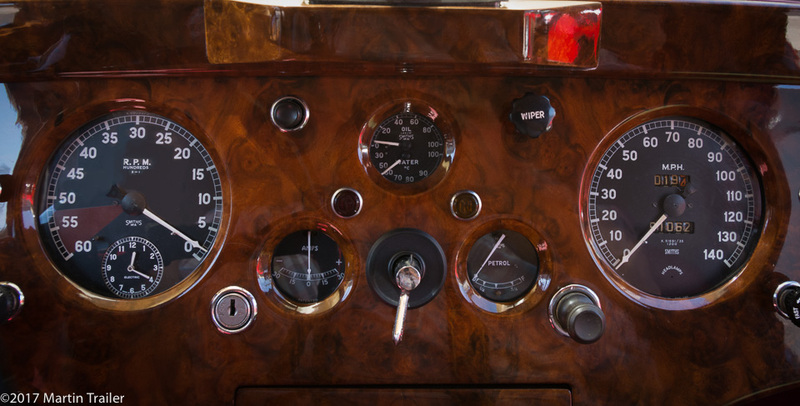 Notice all the gauges and control knobs. Everything from water pressure to engine RPM, fuel and temperature gauges all necessary to manage the water flow and pumps for this fire truck. All of this so the Firemen can do their best to save people and property. 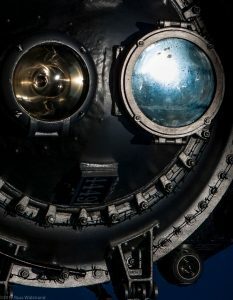 This image was made in a large Museum building that houses dozens of these huge pieces of equipment. The overhead light was soft but direct. The only fill was from a light colored wall off to the side. I was mesmerized by all the dials and controls on the panel. The desire to create this picture and to record the myriad of dials was so that later I could remember and appreciate what is involved in part of what the professional Fire Fighters do on a regular basis. Time passes much too quickly, it seems like only yesterday I was starting my career as a photographer. I am very pleased that I still love to make images. Like a addict eager for the rush, I am easily drawn back to picking up the camera to get that high. 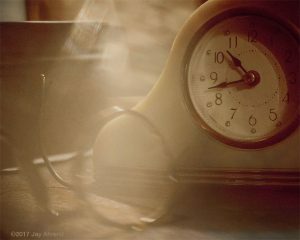 While listening to Stevie Nicks of Fleetwood Mac’s recording Landslide (circa 1975), I was inspired to create an image about time and getting older. There was no fancy studio lighting or Photoshop techniques used here, I simply opened up the f-stop to create a shallow depth of field and shot through my open fingers. The dream like light effect was the result of my fingers that were directly on the front of the lens causing the soft out of focus blur and the rays of light came from the table lamp that lit the scene glancing off my polished ring. I am drawn to old school, vintage things. Craftsmanship seems to have diminished with many things we buy today. Labor costs have risen so much the handmade look and feel is pretty much gone. Today everything is stamped out and just assembled. Those tiny little imperfections that give character to manmade things is lost. 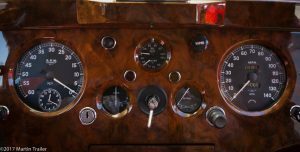 Here is a classic 1953 Jaguar Drophead Coupe dashboard with all of those qualities. The handcrafted polished burled wood with analog Smith instruments for all the most important things to keep an eye on. Can you hear it purr? Photographers are often asked to document events which symbolize a passage of time. Weddings, births, graduation, birthdays, the Little League team photo; these are all examples. Today, after over a decade of driving my trusty Scion xB, he (yes, he is a ‘he’) turned 100,000 today, and this is the moment just before that transition. His name is ‘El Mosquito’, because his custom exhaust system emits a buzzing sound that people notice as we pass by. His license plate is ‘Creador’, which in Spanish translates as ‘Creator’….that’s me. We are compadres who travel in time together.Those of us living and driving in LA, cannot avoid our cars become synonymous with who we are: extensions of our personality and lifestyle. Mosquito (I drop the ‘El’ because it’s too formal for my best friend) and I have endured marriage and divorce, prosperity and recession, renewed faith in relationship and the pain of that dissolving. I knew this milestone was coming, and have been carefully monitoring the odometer in preparation. 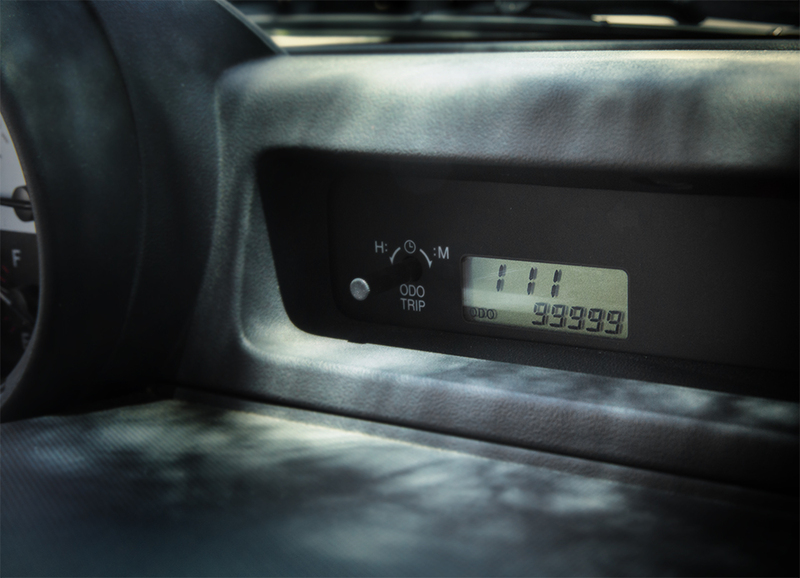 Notice the numerology: 99999 adds up to 45 which when reduced to a single digit is….9. The time of 1:11 represents the number 3, which is the square root of 9. You can’t make this stuff up. I found a shady spot just as the numbers aligned and the dappled sunlight coming through the tree branches lent grace to the otherwise almost colorless scene. Thank you Mosquito!